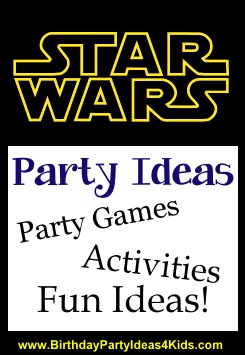 Star Wars party ideas for kids ... the force will be with you when you use these great ideas for birthday games, activities, invitations and more! All have a Star Wars theme and are budget friendly. Attach party invitation information to small light sabers. On black note cards affix stars and/or spaceship stickers. Print party information in Star Wars font ... or use the font that makes it look like it is going away from you (like they use in the beginning of the movie). Print out party information on large labels and stick onto candy bars such as Milky Ways, Star Crunch bars or Mars bars. Hang glow in the dark plastic stars and planets from fishing line outside on trees for the guests to walk through on their way to the party. Decorate the party table with a black table cloth and solid color gold plates, napkins, cups and flatware. Place gold star confetti on the party table. Hang strings of small white lights around the ceiling or walls to look like stars. Make or buy a Star Wars themed piñata. Blindfold the guest and tell them to use the force to smash the Piñata. While guests are arriving let them decorate black or gold bags with Star Wars stickers and stars to use later in gathering candy for the Piñata. Give everyone a plastic light saber and a blown up balloon. Have the party guests stand in a big circle and then tell them to keep their balloon in the air by hitting it up lightly with the light saber. If the balloon touches the ground they are out ... last one with their balloon in the air wins. Teams move a balloon from the starting point, around a cone, and back to the starting point where they will hand their balloon off. Divide kids into teams and have them line up one right after the other. Give each team one light saber and one blown up balloon. One by one they must move the balloon by hitting it gently on their light saber around the cone and back to the line. The balloon can not touch the ground. If it touches the ground that person must go back to the line and begin again. First team with all of their players to finish wins. Fill two containers with lots of slime. Place them at the end of the playing field. At the other end set up two see through containers that both have a mark or fill line at the same height. Divide party guests into two teams and give each team a plastic spoon. The players must one at a time run to the slime, fill the spoon with the slime, run back to the starting line and place their spoonful of slime in the see through container. Guests continue one after the other until one team's container reaches the fill line. Before the party make lots of "asteroids" by crumpling up aluminum foil into balls. They can be all sizes. Inside some of the "asteroids" place a prize or a number that they can turn in for the corresponding prize when they find it. Tell the party guests to find all the asteroids they can and then when they have finished finding all of them tell them to open them up to see if there is a prize inside. This Star Wars game is also fun to play at night with only the use of flashlights. Yoda Soda - In a punch bowl place Sprite or 7UP and then float scoops of lime green sherbet. Light Saber Fruit Kabobs - Place cut up fruit on wooden skewers. Hot Dog Sabers - Hot dogs! Pizza Planets - Serve pizza with mozzarella slices cut into star shapes. Use a star shaped cookie cutter to cut out cookies, rice krispie treats, sandwiches, cheese, etc. Jabba the Hutt Jell-O Jigglers - cut out Jell-O Jigglers in fun shapes.